Fixed Frequency Synthesizer: SFS1520C-LF Low Noise PLO for Satellite Communications | Z-Communications, Inc.
Click on the image above for the high resolution version. Z-Communications, Inc. announces a new RoHS compliant fixed frequency phase locked loop model SFS1520C-LF operating in the L-band. 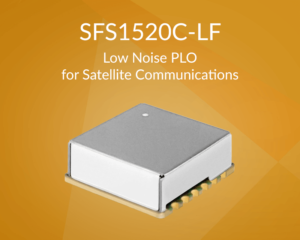 The SFS1520C-LF is a plug and play PLO allowing for quick integration and designed to produce a fixed signal at 1520 MHz when utilized with an external 10 MHz reference oscillator. This simple to use PLO features a typical low phase noise performance of -100 dBc/Hz, -110 dBc/Hz, and -133 dBc/Hz at the 1 kHz, 10 kHz and 100 kHz offsets, respectively. The SFS1520C-LF is designed to deliver a nominal output power of +3 dBm while operating off a VCO voltage supply of 5 Vdc and drawing 28 mA and a phase locked loop voltage of 3 Vdc while drawing 10 mA. This unmatched product features a typical harmonic suppression of -20 dBc and spurious suppression of -65 dBc. It is housed in Z-COMM’s standard PLL-V12C package measuring 0.6 in. x 0.6 in. x 0.22 in. The SFS1520C-LF is also ideal for automated surface mount assembly and is available in tape and reel packaging. The SFS1520C-LF is a great choice for quick product rollouts, and is well suited for satellite communications and test instrumentation requiring operation over the temperature range of -40 to 85°C.